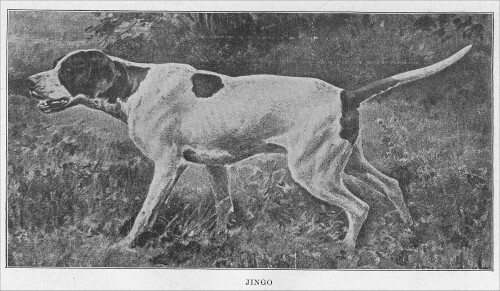 -- "Jingo", image scanned from Field Dog Stud Book, Vol.II, 1902. -- Image scanned from Field Trial Records of Dogs in America with other Authentic Statistics, 1874 (to July 1) 1907, by Maj. J.M. Taylor, 1907. 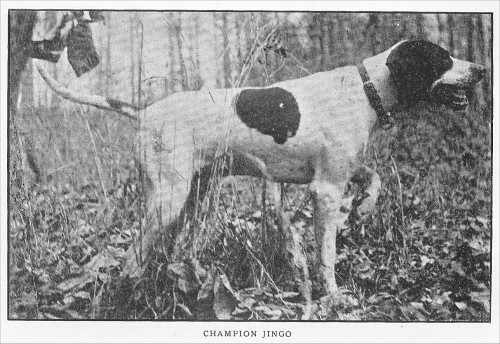 -- "Champion Jingo", image scanned from The Modern Pointer by A.F. Hochwalt, 1923. "Phillip's Daisy" ??? ... "Derby's Daisy" ??? ... "Edge blood" ??? ... see information above about "Daisy"
Babe Jingo -- w: 1898, out of "Dot's Pearl"
Earl Jingo -- w: 1898, out of "Pearl's Dot"
Golden Rod -- w: 1896, out of "Rose Le Hessen"
Gorham's Dorothy -- w: 1898, out of "Queen of Hessen"
F.Ch. 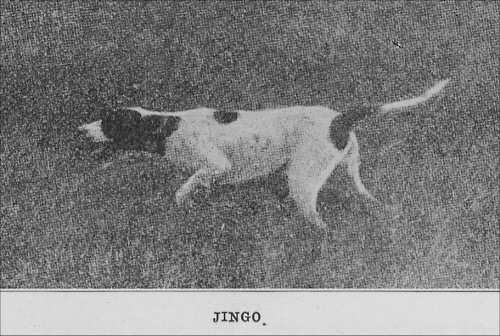 Jingo's Boy -- w: 1898, out of "Dot's Pearl"
Jingo's Dot -- w: 1897, out of "Pearl's Dot"
Jingo's Light -- out of "Rose Le Hessen"
Lad of Jingo -- w: 1897, out of "Dot's Pearl"
King Cyrano -- w: 1899, out of "Kate Kent"
Young Jingo -- w: 1896, out of "Pearl's Jingo"
Nat.F.Ch. Becky Broom Hill -- 1922, 1923, 1925 Nat.F.Ch. Nat.F.Ch. Comanche Frank -- 1914 Nat.F.Ch. Nat.F.Ch. John Proctor -- 1916 Nat.F.Ch. Nat.F.Ch. Manitoba Rap -- 1909 Nat.F.Ch. Nat.F.Ch. Mary Montrose -- 1917, 1919, 1920 Nat.F.Ch.